I Cannot Tell A Lie is a morally inspired story about lying using a Christian slant to help model the correct response to a situation that involves the truth from being told. The illustrations are colourful and engaging and each page has half eaten cookies upon it to remind the reader the underlying principle of the story. After Jody breaks her mothers special cookie jar, she is devastated and decides to lie to her mother about her involvement. 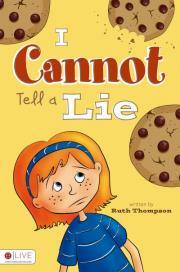 When her mother questions Jody about the broken cookie jar, Jody points the blame on her sister. After a family devotional on which the scripture studies were about God's commandment "Thou Shalt not lie", Jody is left feeling confused and upset. She doesn't like how she feels and she doesn't know what she should do to make it better. Turning to God through prayer, Jody asks for help in her choices...will Jody learn from her mistakes?? Or will she ignore the bad feeling inside her and let the lie get bigger? Fighting with the demons inside of herself, Jody wonders, should she tell the truth? Or continue lying to save herself the punishment that is sure to come?? Only Jody can choose to make the correct decision by looking deep within herself and deciding what kind of person she wishes to be.